Spontaneous Creations is the freeform art class designed to liberate us from preconception and form. After intro activities we'll create a large-scale artwork together. Check the Coming Events page to see scheduled events. 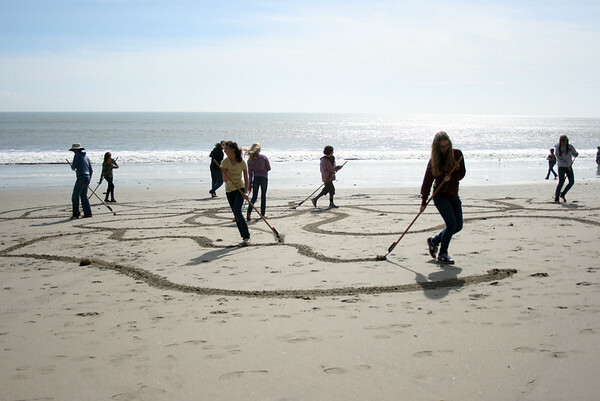 The beach is an amazing canvas for creative expression. And the rake is a tool that uses the whole body. Its a perfect combination for spontaneous, body-centered, free form exploration. - Take some aerial group photos of our creation! I hope you can join us. Its a magical to experience the creative flow moving through your body while being barefoot on the beach. Note: Physical condition notice- moderate physical capacity needed for raking as well as getting to the from the beach location.